Along with colleagues at Laindon Archive and Basildon Heritage we are continually researching those heroes who had a connection to the Borough and lost their lives in the First and Second World Wars. 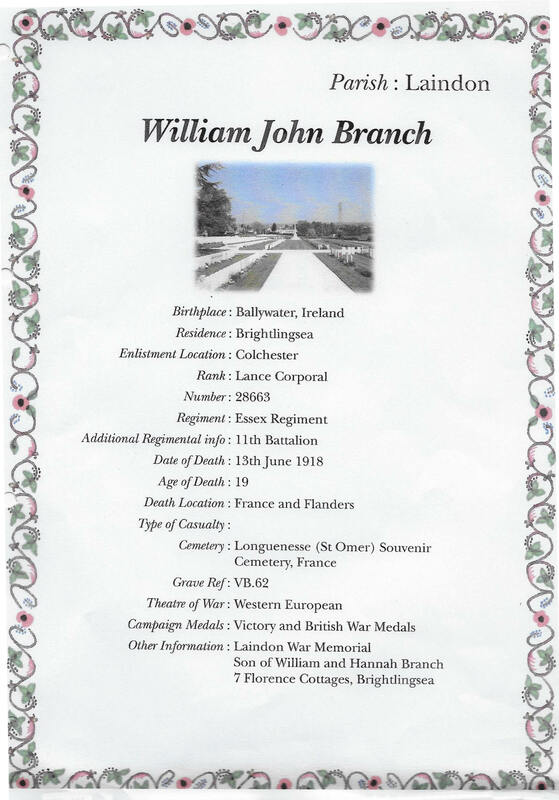 William John Branch died at the age of 19 on 13 June 1918. The information we have is that when he enlisted he was residing in Brightlingsea and his parents were living at 7 Florence Cottages, Brightlingsea. I recall that when I was in the local Scouts, the local district commissioner was a ‘Bill Branch’ obviously known to us all as ‘Twiggy’ that would have been in the mid 50’s. Maybe he was the chap who ran the cub pack in the 30’s and had risen in the ranks ? Although William John Branch was born in Ballywater, Ireland, his parents William Branch and Hannah Miriam Branch (nèe Hart) married in Epping in 1892. William Branch was then stationed in Ireland as a Coastguard for a while and five of the children were born there, William John on 15th May 1899. It appears the family moved back to Essex (Brightlingsea) sometime between 1911 and WW1. During the late 30s a ‘William Branch’ ran the Wolf Cub pack who met regularly at St. Peter’s Church Hall on the corner of St Nicholas Lane, opposite the “Hiawatha”. According to the 1949 and 1951 Electoral Register this family were living at ‘Westmoor’, Basildon Rise, Laindon, i.e. William Branch, Minnie E Branch and William H Branch. Unfortunately I have as yet been unable to trace any connection with this family to the William John Branch on the War Memorial. However, I will keep on searching.